As of version 2.9.1 ScreenSteps Desktop will display templates located in your Workgroup Resource folder. To make templates available to every desktop client just create a Templates folder (1) at the root of the Resource folder. The organization of the Templates folder should mirror that of the standard ScreenSteps template folder (2). Just place any templates files you want to share globally in the proper subfolder. 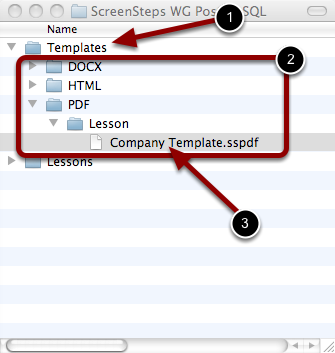 In this example the PDF template Company Template.sspdf will be available to all desktop clients (3).